When you open your phone, which app is your go-to? For a majority of people around the globe, from teens to savvy seniors, Instagram is one of the most popular platforms for sharing experiences with friends and family. Posting images to a profile and adding pictures to Instagram Stories are modern ways for users to keep others informed on different aspects of their lives. When it comes to brands hosting events, making an impression on guests is key to a successful event and its impact on social media. Not only should guests be blown away in person, but it’s important to entice every attendee to share the event on Instagram. Many brands have turned to featuring Instagrammable moments or installations at their events, which are unique elements that instantly draw the attention of guests and their followers on the platform. Read on for tips on how to make your event Instagrammable! Capturing guests’ attention is always easier said than done, but creating installations using common items or new products is a unique way to make an impact. If you’re looking to produce a backdrop for a photo booth, or a product-filled step and repeat for a launch, an out-of-the-box creation provides an opportunity for attendees to snap photos and post all over Instagram to organically promote your brand. Our team has worked with hundreds of brands to make clients’ events as Instagrammable as possible, and a few of our favorite photo moments have utilized everyday items to set their events apart. LaCroix Water was looking for an out-of-the-box backdrop to help showcase their products at the New York Open tennis tournament. We used tennis racquets and tennis balls in the packaging colors of two of their featured flavors to create a playful wall and back bar. Guests were taking photos throughout the event; it was a simple way for guests and their followers to engage with the brand. We also created an installation for a Christmas-themed Too Faced influencer event using a variety of gift boxes and bags featuring the brand’s name. As influencers took photos and posted to Instagram, the company’s branding and name was seen in every shot. There’s something about neon. Whether neon signs evoke a feeling of nostalgia or the bright, bold colors catch your attention, they’re the perfect addition to a photo moment. Since there are a wide array of colors and fonts to choose from, a brand can create a sign that matches its aesthetic and fits an event’s theme. Whether you decide to use a slogan, hashtag or quote, adding an eye-catching branding element will seamlessly slip in your brand into every image posted to social media. In recent months, our team has worked on many events which incorporated neon signs. We Are BMF was looking to complete a step and repeat featuring a neon sign. Our team created a greenery backdrop to complement the neon sign, including fresh mint to align with Colgate’s new toothpaste. An acrylic hashtag featured on the wall made it easy for guests to include while posting to their feed or Instagram Stories. What’s more calming than a space full of lush plants? We can’t think of much. Besides evoking a relaxing vibe, plants and greenery are excellent additions to event installations and photo moments. Between greenery walls and tropical plant installations, there are many opportunities to transform a space into an Instagrammable environment. Whether you keep it simple or fill an entire venue with plants, guests will flock to photo moments featuring greens. 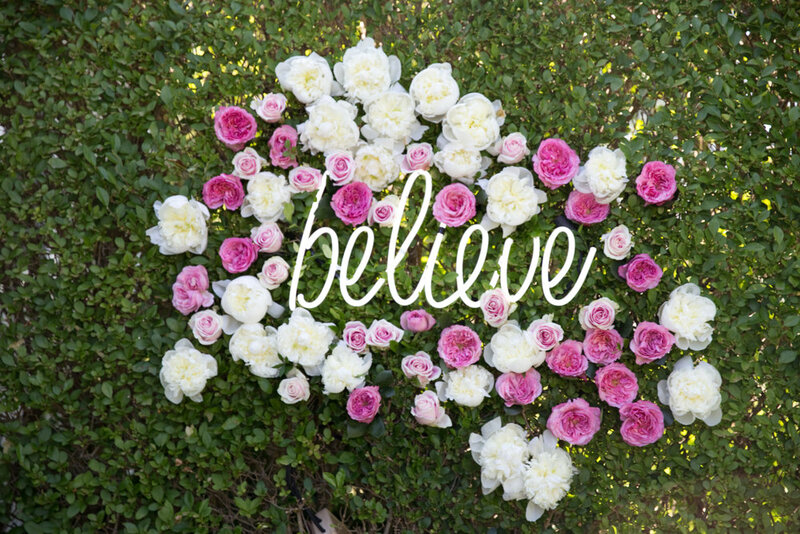 East of Ellie came to our team to create a greenery filled venue for their client bareMinerals. We created a crisp white photo backdrop with glass orbs filled with deep green porthos organically placed throughout the wall. The wall also included bareMineral’s logo and slogan so their branding was seen, but not overtly so. Balloons have transformed from an essential at childhood parties to the foundation of one of a kind Instagrammable moments. Due to the different colors and shapes, balloons installations are completely customizable. Arches and free-flowing installs are popular types of balloon installations that are popping up all over Instagram. 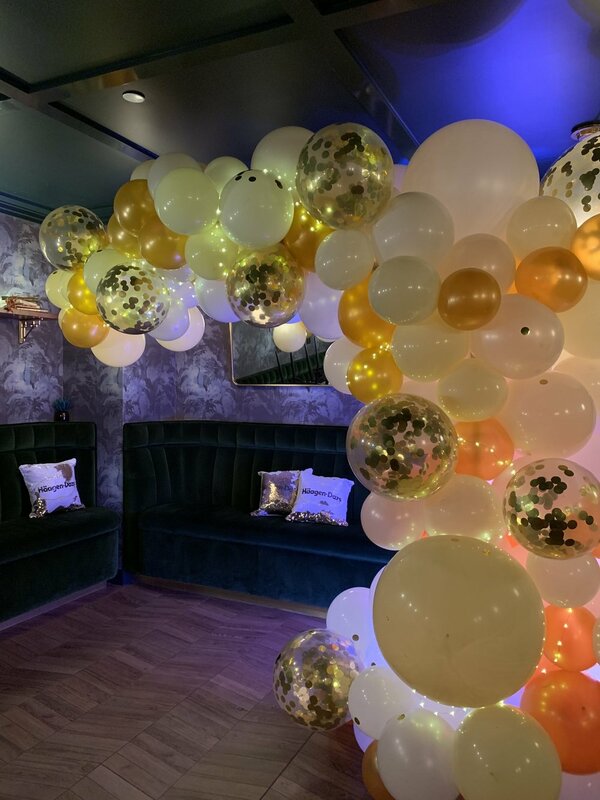 Flowers and greenery are additional elements to add within a balloon installation to elevate it and make it even more photo worthy. We worked with KMA Events to assist their team in transforming a space for NeoCell’s rebranding launch. We chose balloons in a variety of sizes to transform a simple swing into a playful photo moment. NeoCell’s brand colors of pink and purple were used in the mix of balloons utilized. We added pops of pink florals and greenery to ensure this install was perfect for the “gram”. How will your brand be received on Instagram? Exposure on social media is essential for the growth and reputation of a brand. Whenever an event is thrown to launch a product or showcase a new collection, an event’s presence on Instagram will create buzz and expose your company to thousands of consumers. As you design your next event, keep these ideas in mind. The next time you check your feed, you’ll see countless of posts, tags and hashtags highlighting your event and your brand!